At its meeting on 6th September, Argyll Presbytery paid tribute to the late Ian Maclagan, first Clerk to the Presbytery of Argyll, who died on 29th June 2016. 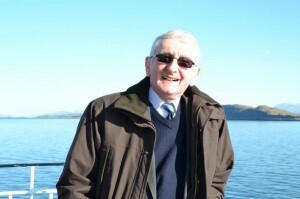 Ian was celebrated for his polymathic achievements in historical and legal scholarship – especially maritime law – as well as that peculiarly Argyll brand of writerly activity which brings together history, folklore, geographical knowledge, love of place, and detailed technical understanding of ships, propulsion, piers, currents and tides, and everything else, that made Ian Maclagan such an authority on transport by water. Ian was instrumental in the birthing of the Presbytery of Argyll, and as Clerk he set its efficient, progressive tone, shorn of any but the necessary processes to serve the Church in such a widespread and scattered territory. The extensive powers of committees, the empowering of the local under the intimate oversight of the Court over everything, the way in which the unity of the Presbytery is balanced against the local and the specific in an organic and supportive way, are all part of Ian’s legacy, working collegially with many others and offering his guidance authoritatively but quietly, logically, persuasively. And then there is that aspect of the work of a Presbytery Clerk which perhaps only Ministers can see best, or even at all; the Clerk is the pastor pastorum, the immediate minister of the Presbytery’s practical and pastoral support. For someone not ordained to the ministry of Word and Sacrament, Ian had a remarkable insight into the pressures and challenges of ministry, and, however complete his theoretical and legal understanding of these things might be, this could only come from a remarkable human empathy and sympathy.